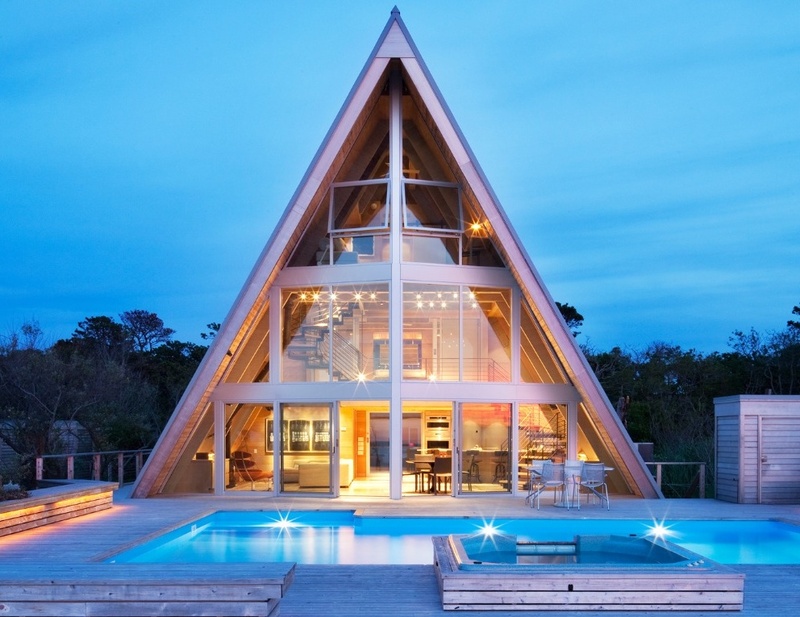 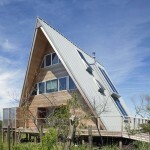 Rising from the shores of the Fire Island Pines is an A-frame house, not an usual silhouette for a beach house, but a bit traditional, one may think, for the hip, modern vacation spot. 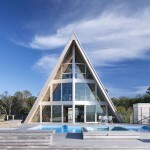 Think again, though, because Bromley Caldari Architects transformed this existing beach rental into a contemporary retreat, rethinking the iconic 1960’s architectural style, hence its name A-Frame Re-Think. 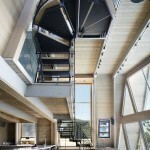 The firm’s main task was to remove the spiral staircase that split the home down the middle and created dark, cramped rooms. 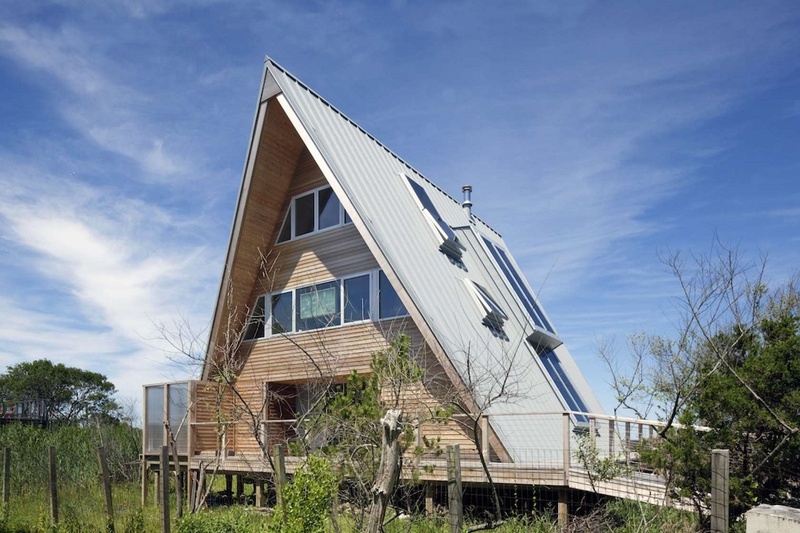 In response to the challenge, architects R. Scott Bromley and Jerry Caldari broke through the envelope of the three-story structure, weaving in a modern, sculptural staircase. 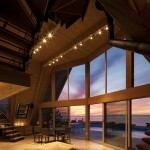 The problematic, six-foot diameter steel spiral staircase, also blocked the stunning beach views from inside. 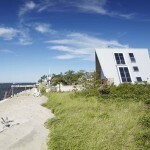 Since the lot coverage was at its limit, Bromley Caldari utilized a local law that allows bay windows to project two feet from the building’s envelope. 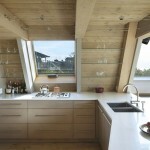 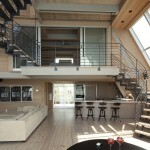 The new staircase was placed within two of these windows, staggered at different elevations on each side of the home. 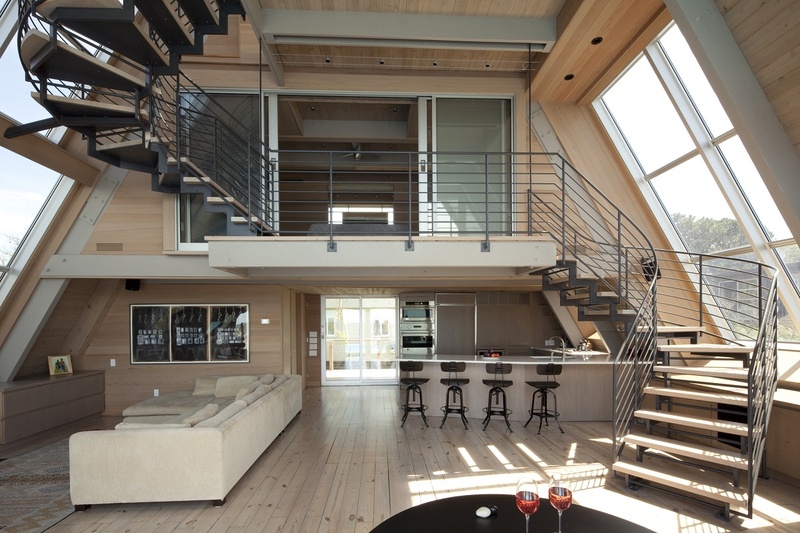 A catwalk balcony off the master bedroom connects the two sides. 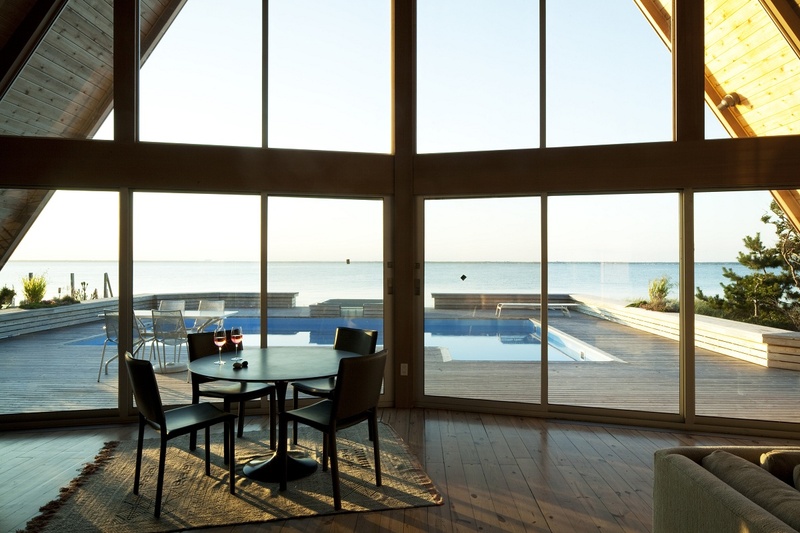 A double-height living/dining room stretches the length of the first floor, positioned to take advantage of the expansive north-facing windows that frame beautiful bay and pool views. 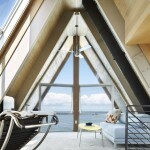 Upstairs, the master suite is offered the same view through full-height glass sliding doors, which also fog up when the homeowners desire more privacy. 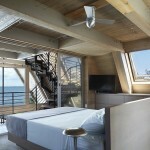 A second bedroom and convertible den are nestled under the third-floor peak and connected by a walk-through bathroom. 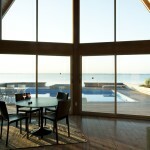 Outside, the home’s many skylights feature prominently, as do the wrap-around ramp/porch and large pool patio. 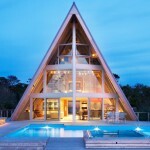 See more spectacular views of the A-Frame Re-Think in our gallery below, and check out all of Bromley Caldari Architects’ work here.